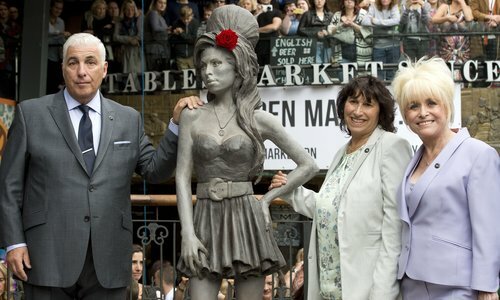 A life-size statue of the late singer Amy Winehouse has been unveiled in Camden. The tribute to the ‘Rehab’ singer was revealed yesterday (September 14) on what would have been her 31st birthday. The Scott Eaton-designed memorial was placed at the Stables Market in Camden, near where Winehouse lived before she died. Amy's father Mitch Winehouse, who unveiled the memorial, said: "It is incredibly emotional to see Amy immortalised like this, but Scott has done an amazing job in capturing her. It is like stopping her in a beautiful moment in time. "The Winehouse family are very grateful to Scott and we really hope Amy's fans love the statue. We want to remind everyone of her talent and that her legacy, through her music and the Amy Winehouse Foundation, carries on. "Camden meant a lot to Amy and vice versa, and to have her forever standing at the heart of the hustle and bustle of that area just fits." Designer Eaton said: "The pose had to capture Amy's attitude and strength, but also give subtle hints of insecurity. The hand on the hip, the turn of the head, the grabbing of the skirt, the turned-in foot - these are all small elements that contribute to the personality of the piece. "The design is not based on any single snapshot, photo or moment in time, but an amalgamation of influences. Hopefully by taking many important moments in her history and drawing on those, the piece comes close to capturing the essence of Amy." Amy died in 2011 at the age of 27 from accidental alcohol poisoning.